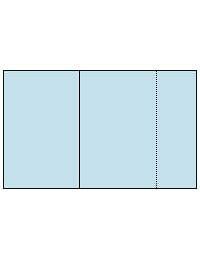 These baby blue bulletins provide a great background for your play programs. You can use the tear-off card to list upcoming events or other plays. Easily print your own forms, saving money by eliminating outsourced printing. Each bulletin is 8-1/2” x 14” including the stub. Folded Size: 8 1/2" x 5 1/2"